She didn't wait 30 minutes before swimming. Convoluted is the word I would use to describe this games story. But then again, we need to wait till Backcover is out to find out more. 167 consecutive days of playing Kingdom Hearts Unchained and counting, good grief this is really bad. Just want to see if there's a title for reaching 200 and 300 days. 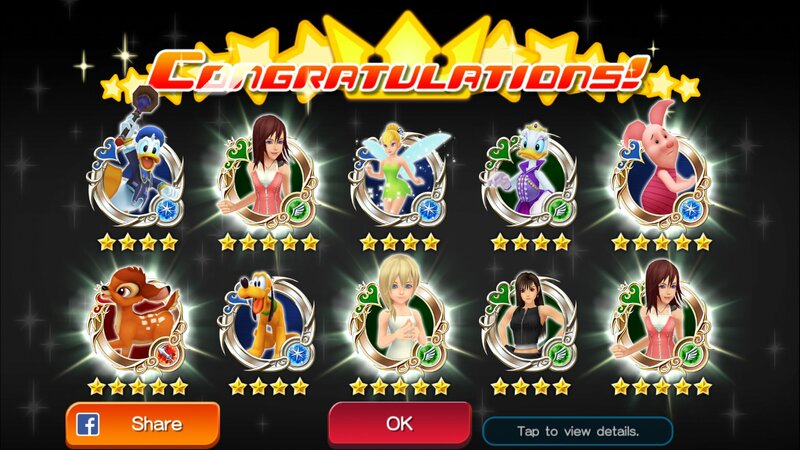 Cost me 400 jewels of continues to get this. 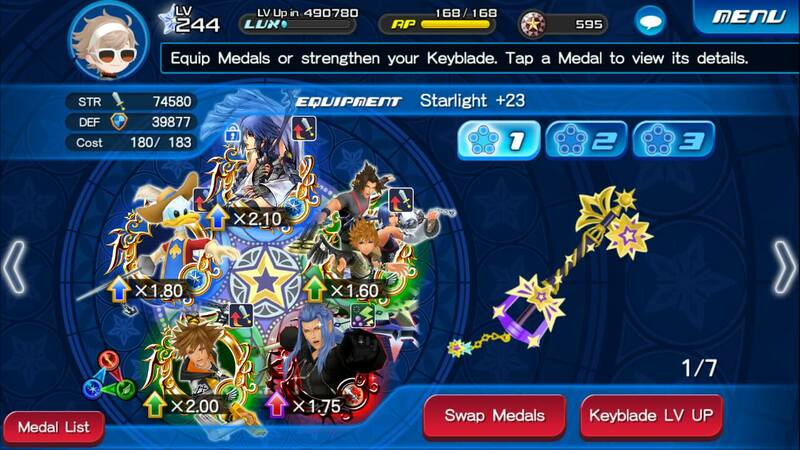 Probably will never get it to +20, but as long as I have the Keyblade, that's good enough for me. We shouldn't have this in the game. Not without Micky and Brooms. It is like being in pre-renewal and having to fight renewal content. I struggled on the first quest, I beat it without continuing, but I can't even scratch the 2nd mission. Edited by MilkyThief, 27 September 2016 - 06:08 PM. 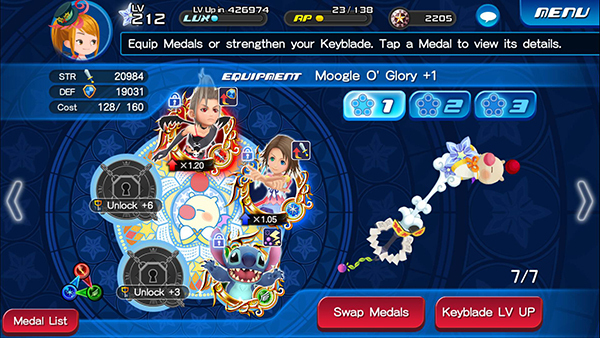 I really want to get Griever, but there's no way I can do Proud Mode with my meager medals. Hopefully, I have a lot I would guilt with them. I did take advantage of this 1500 jewel sale. Got some really nice guilts. 85% on a Saix is awesome. 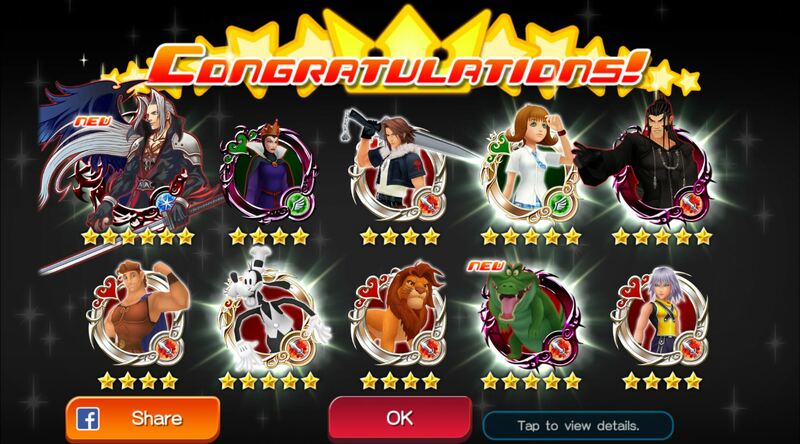 81% on Final Form Sora. Edited by MilkyThief, 28 September 2016 - 12:05 PM. Saix is at 85% Guilt. Illustrated Aqua is gonna be my first guilt when we get Mickeys and Brooms, I can't wait. Edited by MilkyThief, 29 September 2016 - 10:18 AM. I stupidly pulled the 10 pack upright because I got to 3k jewels with today's daily jewel quest..... 5 Level 180 Hammers at once, oh god that sucked. Edited by MilkyThief, 02 October 2016 - 02:36 PM. I'm not a fan of Terra (character-wise), so not majorly upset. 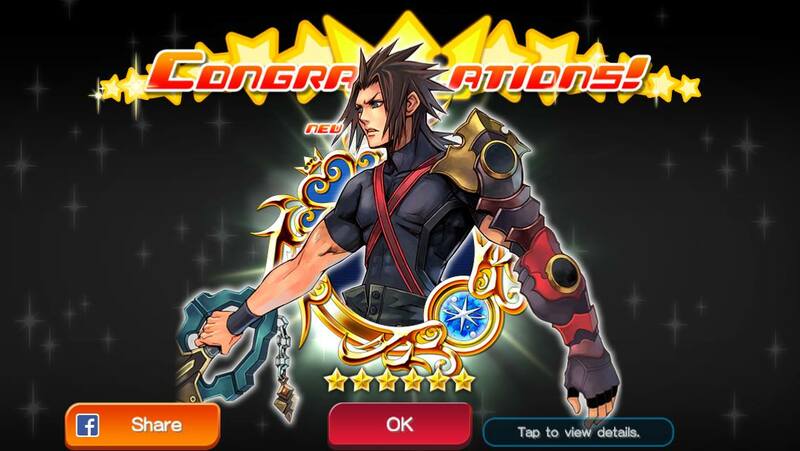 Might be different if you have Ventus. I imagine you looking like Piglet, ouch. Edited by MilkyThief, 06 October 2016 - 05:17 PM. I have no idea, I have never seen one before, it is quest One on One quests, the ones for the +26 materials. They are called "Armed Warrior" and it was a brutal fight, every turn either All Def +3 or all Str +3. Sometimes it got both. It was brutal, but Belle pulled through and I did beat it. Edited by MilkyThief, 06 October 2016 - 06:35 PM. That thing screams "cheap shot." Welp, 500 Jewels, and I guess it can go higher then +26. Kill me now. Congrats. Looks like I don't even have a chance of finishing if you had a hard time. Edited by MilkyThief, 06 October 2016 - 10:38 PM. 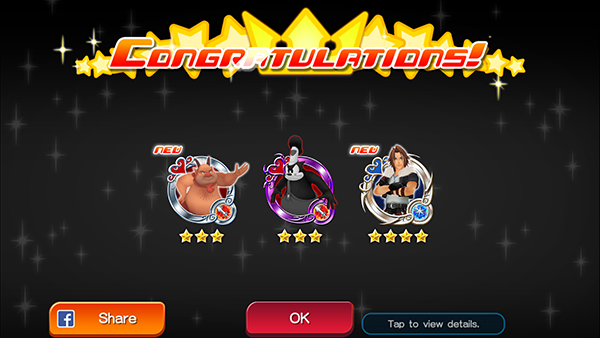 UGH, I am NOT liking Halloween Sora's evolution requirements. >:| It's bad enough the drop rate is crap, but having to collect a ton of it to just get him to 6 stars is retarded. Nevermind getting him guilted. I did 1 guilted version of him. I got a 55% and called it quits. It is the sheer amount of EXP metals needed that scare me away. Also we got Halloween Donald added yesterday to the client. I am guessing next week. Also I got super super super lucky today... I will never ever be this lucky again. I'm more excited about the Ghost costume that I get on the 31st now.... Still nice I guess. A wicked big change in RNG. It will never happen again. Edited by MilkyThief, 14 October 2016 - 08:12 PM.